You know it’s a personal blog when it doesn’t update for a while. Ergo, you are reading a personal blog. Shut up. Last time I wrote anything on here I mentioned getting to go to the Winter NAMM show in Anaheim with my friends Jim, Vann, and Tyler. I haven’t really written about it since I haven’t really written about anything, but I can assure you that I indeed went and it was indeed awesome. Most of you have already heard me talk about it in person, due in no small part to the fact that I pretty much wouldn’t shut up about it for a week or two after I got home, so this is just for fun. Surprisingly, I didn’t see that many big names play. There were some excellent people performing, but not so many that I knew the names of. I did get to see the Travis Larson Band play though, who are always excellent. They even played Nevele, which is one of my favorite songs by them. I did hear that there were huge names walking the show floor, and since everybody sort of tried to act like they were rockstars, it was hard to tell who was who without knowing faces, which I don’t. But it was pretty cool to bump into people and realize that some of them may have actually been rockstars. I didn’t have quick enough eyes to read everyone’s nametags. 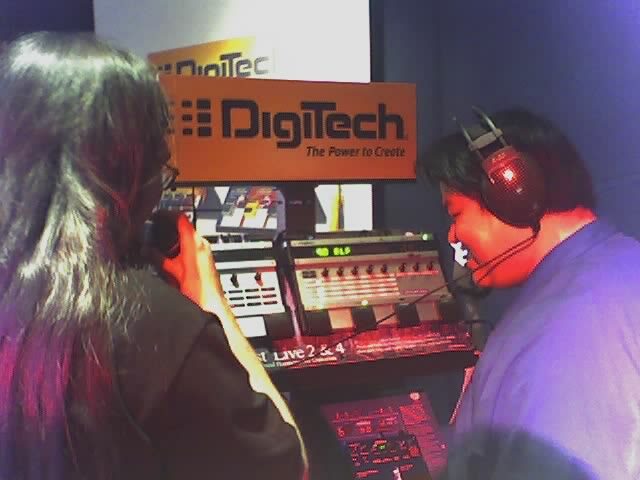 Supposedly Slash was walking around the Digitech booth (home of a hilarious and excellent vocal harmonizer that we played with for about an hour) a little while before we were. 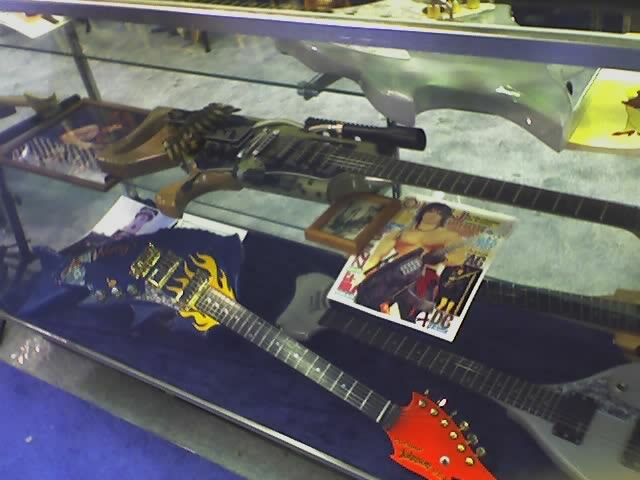 We narrowly missed seeing Alexy Leiho at the ESP booth (dammit!) and while I did see Brendan Small signing things I didn’t get to go up and say hi since the line was packed with Metalocalypse fans and I wanted to go see other things. 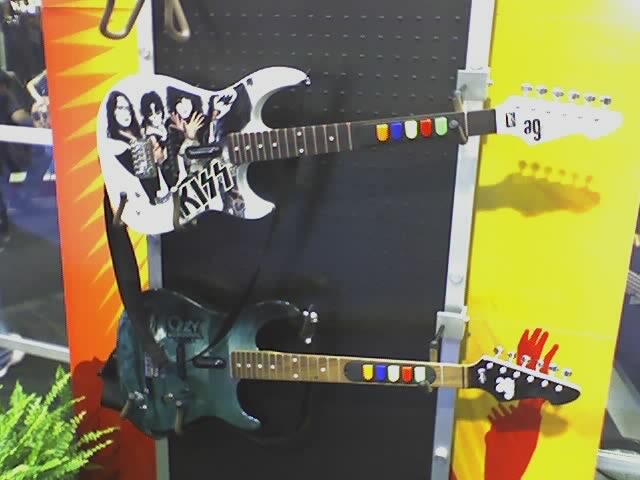 Really, I was there to see neato music toys, and they had those in spades. If you enjoy playing guitars, drums, or keys, you had about a million of them to look at. 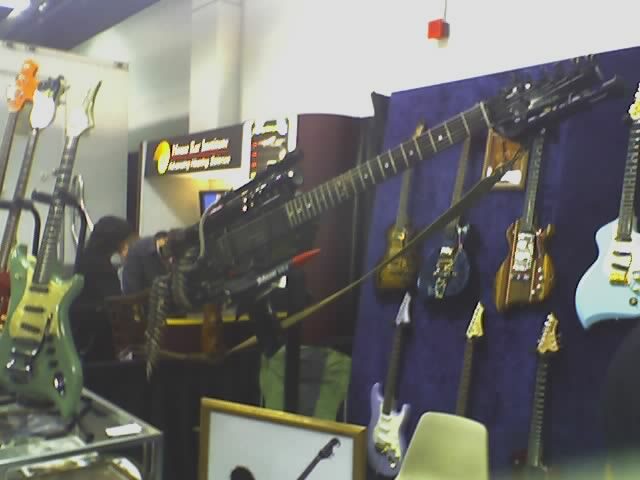 Even people who don’t play guitars could get in on it at the Peavey booth. 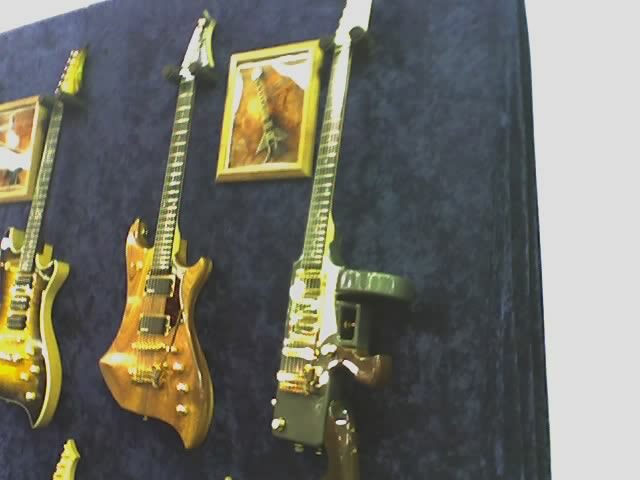 They had guitars made to look like guns and other things. Otheroom.com has documented this better than I could ever hope to. 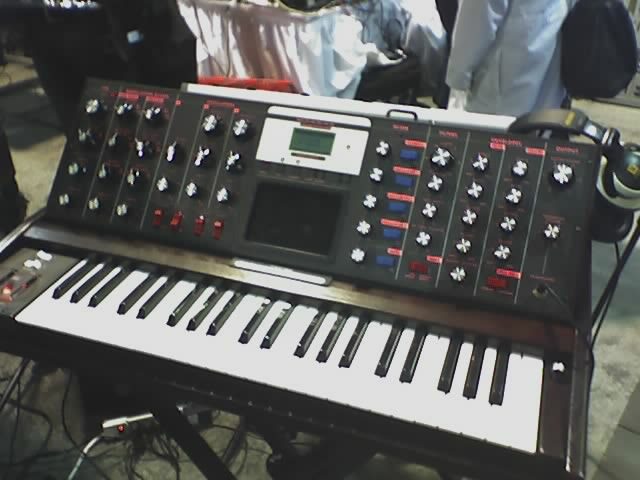 I spent a while playing with keyboards, everything from Alesis to Roland and whoever else I could find. 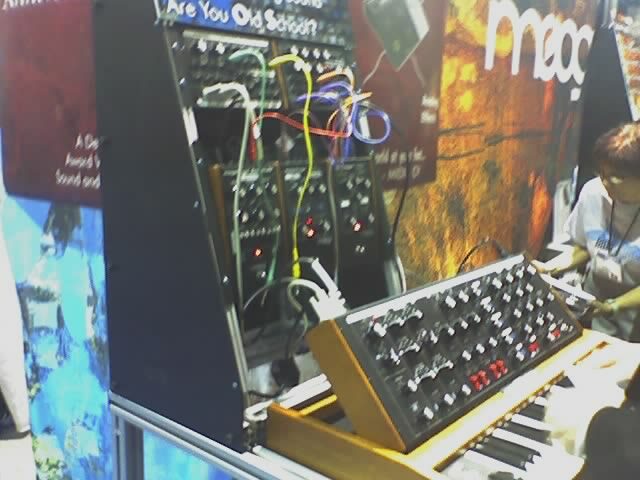 One of the highlights for me was playing the melody to Robbie’s Rocketship on this Moog Voyager they had set up next to a guy waving a theremin wand around. 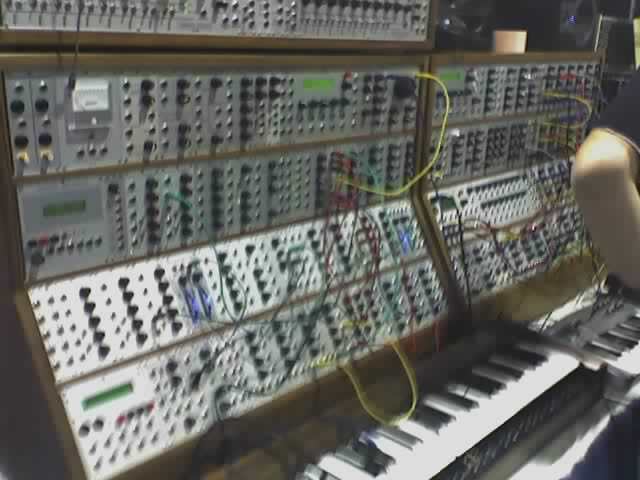 It was neat – playing a similar sounding patch on an analog synth to a song that has so far only ever been played on digital synthesizers was really fun, and made me feel like a bit more than just some guy making noise on his computer. Even if that’s what I am. I don’t care. One booth in particular made a good story. Drumagog is a product that triggers sampled drum sounds in response to transient response from microphones. 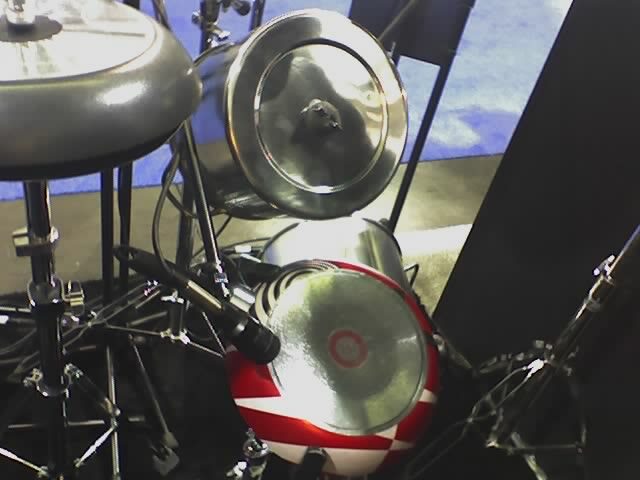 The idea is that you can record a drummer with a mic on every piece of his set, and then replace his recording with a sampled drumset, perhaps one that fits your mix or style better than the equipment you had, and use those sounds while keeping his groove and the specific elements of timing that make a recording more ‘human’ than a sequenced track. 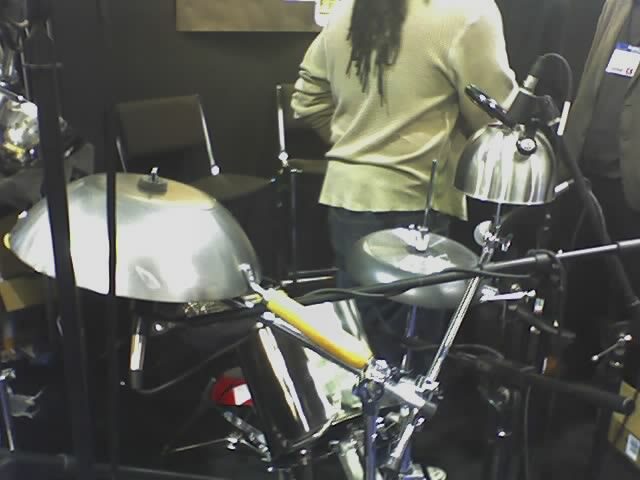 Anyway, to prove that this would work regardless of what kind of drumset you were recording, they set up this one. Here’s another picture that shows off the mic placement and the bass and tom drums. Yes, it’s made of what it looks like it’s made of. The pot they put the bass pedal on worked particularly well, as did the upside-down pan snare. All of this was played with whisking brushes, mind you. I wasn’t sure how moving the hihat pedal stuck through the frying pan was going to mute the hat correctly, but you would be correct if you assumed that at this point I did not care because I am sitting down in front of a small gathering of people banging on kitchenware with as much drummer as I have in me, while drum sounds are coming out of a speaker next to me. I wish I could convince the FLC lab to let me put Drumagog on their machines, since then I’d cover the room with little cheapo contact mics and then tell students to start hitting stuff and listening to what comes out. I wish more students came into that lab. They’re missing out. That’s probably enough for today. I’ve been meaning to write this post for quite some time but just haven’t sat down at the blog long enough to do it.